“It’s a national shame and forgotten epidemic. While there had been significant effort to tackle rates of diabetes, heart disease and cancer in Indigenous communities, STIs had “really been left off the agenda”. James Ward from the South Australian Health and Medical Research Institute. He has presented the data to the government and helped design the action plan now under consideration. 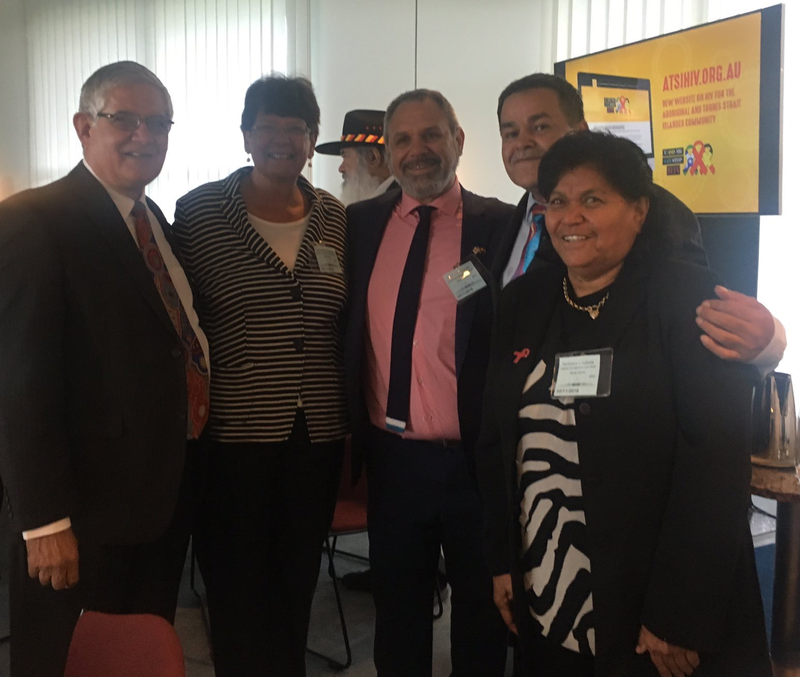 Photo : James Ward (in Centre ) with the Hon Ken Wyatt Minister for Indigenous Health , NACCHO CEO Pat Turner, Mark Saunders and Professor Gracelyn Smallwood HIV Awareness Week. ” The Department gave no explanation as to why or how the funds would be redirected to alternative providers, leaving Aboriginal and Torres Strait Islander Gay, Lesbian, Bisexual, Transgender, Intersex and Queer (LGBTIQ) community members with nowhere to go. This comes at the same time when Aboriginal and Torres Strait Islander STI and BBV rates are increasing at a rapid rate. Liberal senator Dean Smith, who chairs a parliamentary liaison group on the issue, believes he is close to securing a $24 million commitment to fund a three-pronged attack on STIs in Indigenous communities. Alarming rates of syphilis and other sexually transmitted infections in Indigenous communities – in some cases up to 132 times the national average – have prompted a call from within the government for urgent action and emergency funding. The latest data, presented to the Turnbull government as part of the push, shows Indigenous people remain markedly more susceptible to STIs, particularly in remote areas, with growing concern the diseases are acting as a gateway to HIV. A syphilis outbreak in northern Australia caused the number of diagnoses Australia-wide to rise to 2736 in 2015, with 16 per cent of those among Aboriginal people. The rate was six times higher than for non-Indigenous people, and up to 132 times higher in remote areas. Gonorrhoea diagnoses stabilised at 626 per 100,000 Indigenous people in 2015 – 10 times higher than the general population, and up to 72 times higher in remote areas. Nearly 20 per cent of all cases were among Indigenous people, with Indigenous status unknown in another 36 per cent. At a Senate estimates hearing on Friday, the Department of Health acknowledged rates of STIs were “ever increasing” and conceded several federally-funded programs had failed over many decades. It would target syphilis elimination, HIV prevention and health education. In particular, a $5.85 million Syphilis Epidemic Outreach Team would dramatically ramp up the provision of screening for syphilis in areas that have seen a dramatic spike in diagnoses. “It would be all too easy to ignore the very real challenges facing Indigenous young Australians in the context of their sexual health and wellbeing,” Senator Smith said. Experts are particularly concerned that burgeoning rates of sexually-transmitted diseases could result in a prolonged rise in HIV cases among Indigenous Australians, which the data shows is already under way. There was a “clear divergence” in HIV notifications, Professor Ward said, with cases increasing among Indigenous Australians despite being steady or even declining in the non-Indigenous population. There were 38 new cases of HIV among the Indigenous population in 2015, double the rate of the general population, Kirby Institute data showed. The problem also extended to the most common STI in Australia, chlamydia. Of the 66,000 new cases in 2015, nine per cent were recorded as Indigenous – but Aboriginal status was unknown in half of all cases. Evidence heard at Senate Estimates this afternoon has revealed that critical sexual health prevention programs for Aboriginal and Torres Strait Islander Australians are being defunded by the Turnbull Government without any evaluation or consultation. The Department of Health has confirmed the Northern Territory AIDS and Hepatitis Council and the Queensland AIDS Council for Sexual Health will have their federal funding ceased on the 1 July this year without any consultation, evaluation or justification. Today the Department gave no explanation as to why or how the funds would be redirected to alternative providers, leaving Aboriginal and Torres Strait Islander Gay, Lesbian, Bisexual, Transgender, Intersex and Queer (LGBTIQ) community members with nowhere to go. Senator McAllister: Have you done any specific evaluation of the programs that you are defunding? Department of Health Official: As part of the agreements that we have with these specific organisations, no we haven’t. Senator McAllister: Did you ask the state based organisations whether if they would be willing to partner with you in an evaluation of the programs? Department of Health Official: I will have to take that on notice, I’m not aware. Senator McAllister: So you have defunded them without a specific evaluation of the programs? Department of Health Official: No, we didn’t ask. Senator McAllister: Didn’t ask, didn’t do an evaluation, defunded. Ok. Without continued funding there are major risks for the mental and sexual health of Aboriginal and Torres Strait Islander LGBTIQ community members, who have unique healthcare needs.